FILE - Local workers haul away a piece of wreckage of Malaysia Airlines flight MH17 at the site of the plane's crash near the village of Hrabove, Donetsk region, eastern Ukraine, Nov. 20, 2014. Investigators probing last year's downing of Malaysian Airlines flight MH17 over eastern Ukraine have found fragments that may have come from a Russian surface-to-air missile. Dutch prosecutors said in a statement Tuesday that the investigators from Belgium, Australia, Ukraine, Malaysia and the Netherlands who are conducting the criminal investigation into the crash of the Malaysian airliner are examining "several parts, possibly originating from a Buk surface-air-missile system." The prosecutors said the parts "are of particular interest to the criminal investigation as they can possibly provide more information about who was involved in the crash of MH17." The investigators, they added, will "internationally enlist the help of experts, among others forensic specialists and weapon-experts," to determine the origin of the parts. 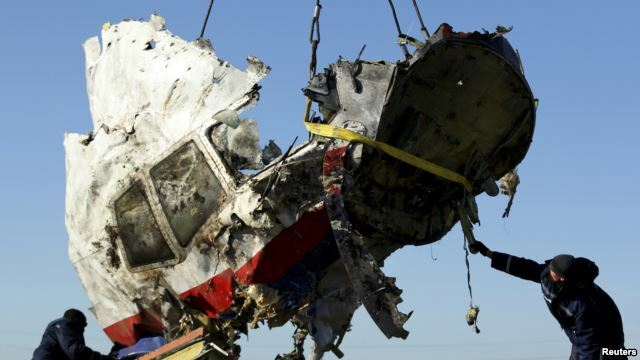 The prosecutors said that at present "the conclusion cannot be drawn that there is a causal connection between the discovered parts and the crash of flight MH17." Flight MH17 crashed on July 17 of last year in Ukraine’s Donetsk region, on territory held by pro-Russia separatists fighting Ukrainian government forces. All 298 people on board, most of them Dutch, were killed. Western intelligence agencies have said the plane was brought down by a Russian-made Buk surface-to-air missile launched from separatist-controlled territory. Preliminary results of the Dutch-led investigation reportedly suggest the missile was launched from a Russian-owned battery that was most likely manned by a Russian crew. Russia has blamed the downing of the airliner on a Ukrainian missile, also insisting that Kyiv bears ultimate responsibility for the incident as it happened in Ukrainian airspace. Ukraine has rejected the claim. Late last month, Russia vetoed a United Nations Security Council draft resolution that would have set up an international tribunal to prosecute those responsible for downing flight MH17.